The Schlüter staircase, known as the “Giant Steps”. 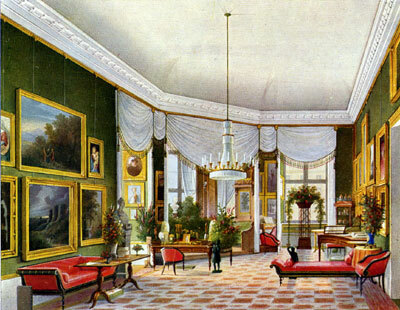 Painting by Eduard Gärtner 1828. 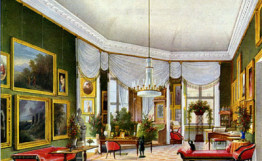 The interior of the Berlin Palace is outstandingly well documented. 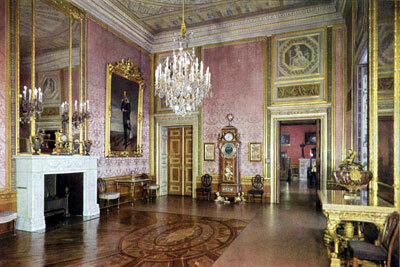 Even so the complete reconstruction of the costly rooms would break any budget. For this reason, we plan to recreate only the most important rooms and in a simpler form but nevertheless in their original dimensions and in their historical locations. Later generations can then decide which rooms they want to further complete. 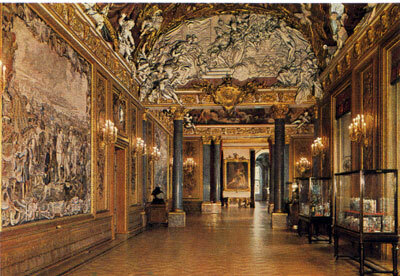 Here we show some of the most beautiful rooms of the Palace from different periods. 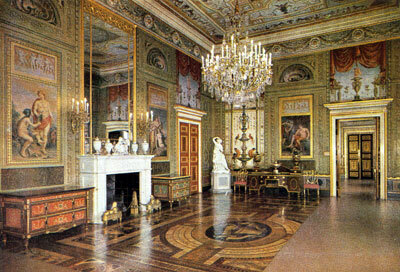 Conceptually, we believe that these rooms should be provided for in the newly rebuilt Palace. 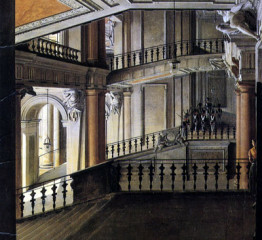 The so-called “Parade Rooms” by Andreas Schlüter in the Berlin Palace, whose entrance were the famous Giant Steps, represented the artistic masterpiece of the renowned German baroque sculptor and belonged to the most important architectural creations of the Baroque in Europe. 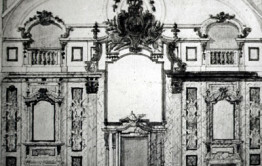 Influenced by the Italian baroque, the architectural artistry of Palladio, and the sculptures of Michelangelo, Schlüter built this unique series of rooms and thereby created a place of splendor in Berlin. 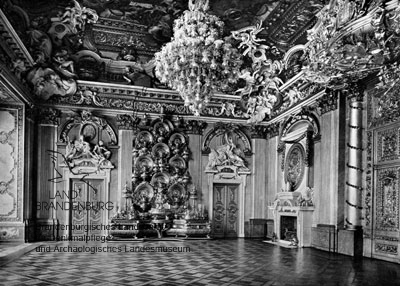 This Back&White picture shows, how wonderful the occasion was to photograph the interior rooms shortly before destruction to save the impression for the future. 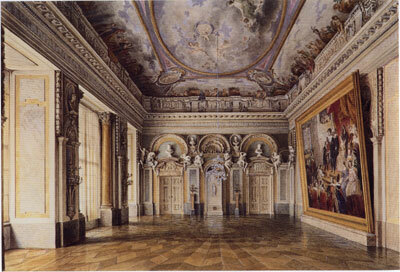 This Hall was the most important ceremonial hall of the Palace and Schlüter’s masterpiece. 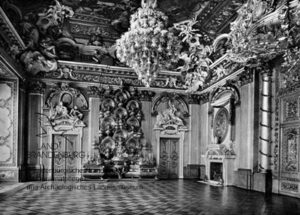 During the bombing attack of February 3, 1945, all the historic rooms of the Palace were burned out up to Schinkel’s State Council Chamber and his White Salon and the Wilhelminish and Mecklenburgish apartments lying below them. 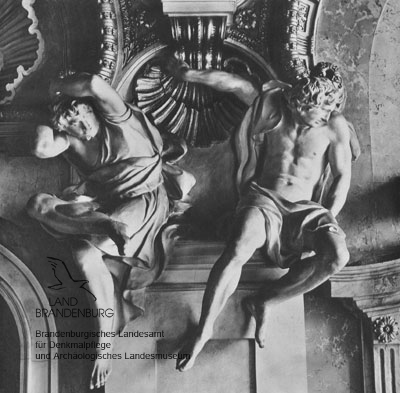 Elisabethsaal: Atlanten, Andreas Schlüter.Nevertheless, much of the plasterwork, for example in the Knights’ Hall, remained intact and was only finally destroyed during the 1950 demolition. 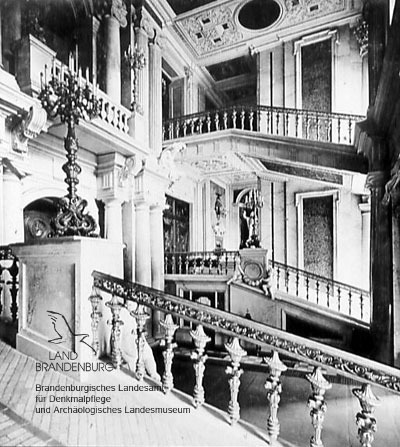 Thus, the most renowned interior creations of Andreas Schlüter, the Knights’ Hall and the Elisabeth Hall, could have been reconstructed, without doubt, because of the continued existence of the stucco work, just as in the 1950s the equally heavily damaged stairway of the Würzburg Residence Palace by Balthasar Neumann was rebulit. 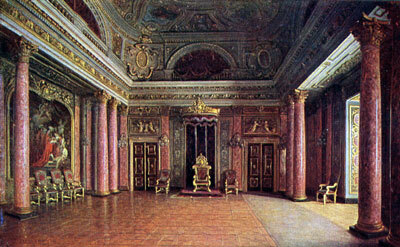 The King’s chambers of Friedrich the Great’s successor, Friedrich Wilhelm II, represent a masterpiece of German classicism. The king gave the task of configuring his apartments to the most famous architects of the time, Erdmannsdorff, Gontard and Langhans. 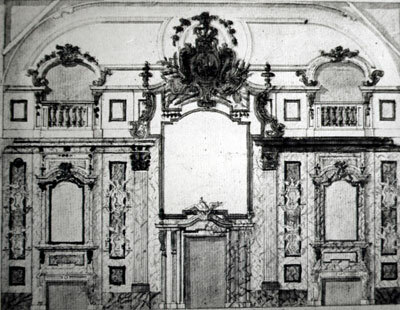 For this purpose, rooms from the baroque period situated on the second floor on the Pleasure Garden side of the Palace in the vicinity of Portal IV were completely revised. In the process, the remains of the space in the northwest corner of the Palace, in which until around 1720 the famous Amber Chamber was housed, disappeared. 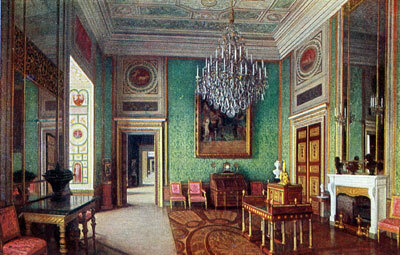 That Chamber was shown to Czar Peter the Great of Russia by Friedrich Wilhelm I. The Czar was so enchanted by it that, after a long negotiation, he finally wrung from the king for his new palace at Tsarskoy Tselo. The payment was a large number of so-called “Long Fellows” (or very tall soldiers) for the King’s personal guard! 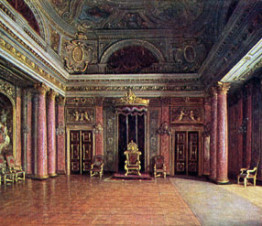 The King’s Chambers constituted the most important series of rooms done in the German classicist style. 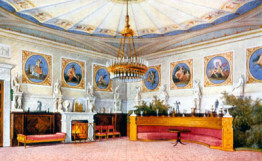 The room was originally equipped with blue silk wall coverings and retained its name despite the change over to a rose color. 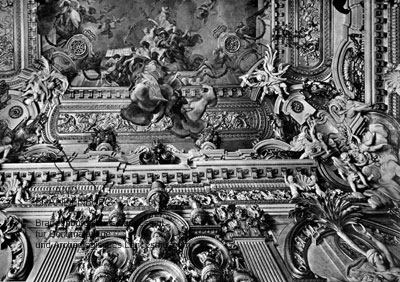 There was hardly any plasterwork in the chamber. Everything was done with tromp l’ oeil painting. 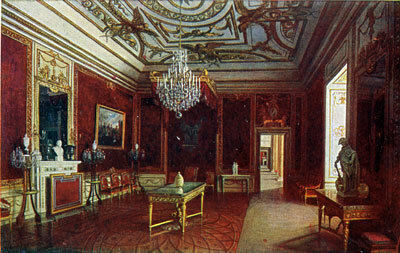 The blue French Chamber in the opposite direction. 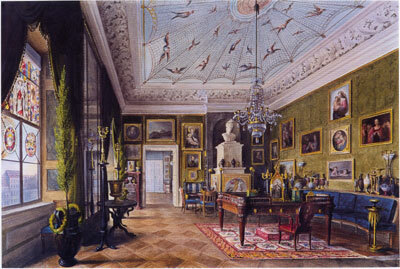 Karl Friedrich Schinkel built the living quarters for the crown prince Friedrich Wilhelm IV in the east section of the Palace at the beginning of the 19th century. 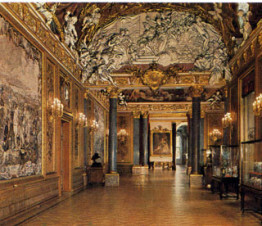 The Tea Salon and the so-called Hall of Stars are among these rooms. The Salon is well documented. Its sculptures still exist as castings in the plasterworks SPK. It could be reconstructed in the new Palace in all its former beauty. 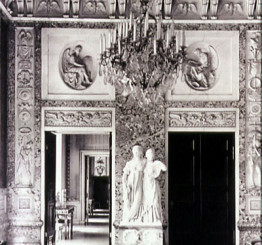 The White Hall, situated in the northwest wing of the Palace, was remodeled three times. Originally, it was planned as the Palace chapel by Eosander, but because of the death of Friedrich I, it was never brought to completion. 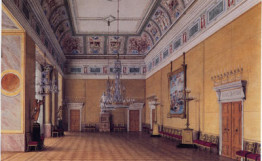 Friedrich Wilhelm I had it redone in only five months as a festival hall in connection with the state visit of August the Strong, King of Poland and Saxony, in 1728. 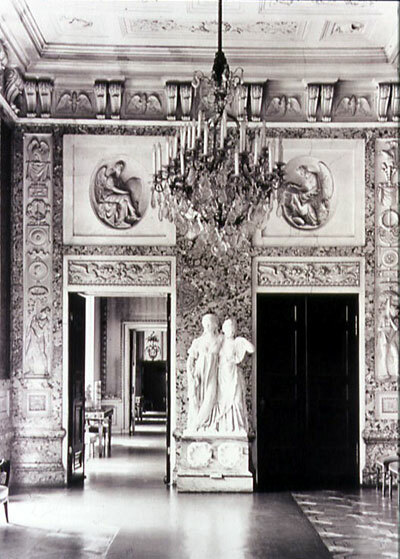 It was decorated with white marble tiles and its ornamentation was silvered, thus earning it the name of “White Hall”. 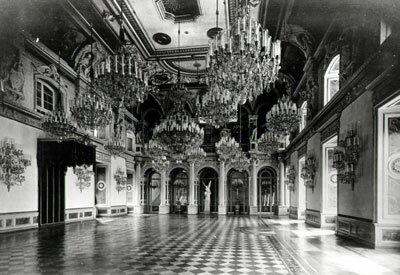 It was used above all for the display of the King’s huge silver treasure, the effect of which was enhanced by the elegant decoration of the hall. 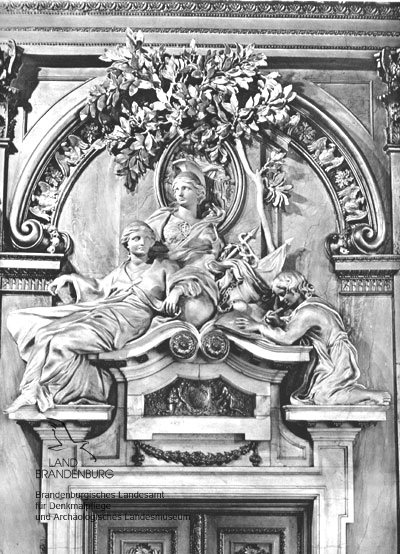 The second version came from Friedrich August Stüler and finally the third, at the end of the 19th century, from Ernst v. Ihne. 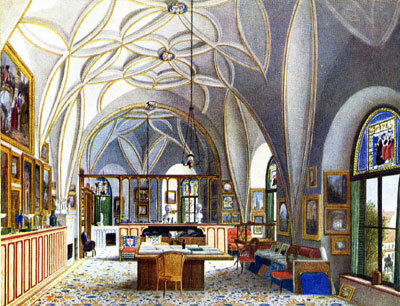 Stüler’s hall had become too small; his decoration was considered too petty for the empire. Hundreds of candles created a veil of smoke, the soot from the heating did the rest. They made the festive, unspeakably costly court dresses of the ladies unusable. After all, there was no dry cleaning yet. Historische Ansicht des BernsteinzimmersIhne’s new hall was enlarged into the courtyard. It measured 16 x 32 meters and was 14 meters high. 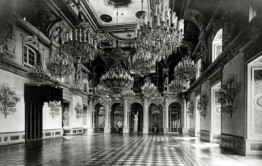 It became the first festival hall of Berlin to be electrified. Indirect lighting replaced the warmth of the chandeliers. It’s hot air heating was run through filters in the Palace cellar. One could finally celebrate huge balls without soot from the guttering candles and dust from the heating ruining the evening clothes. 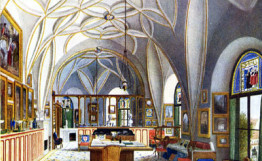 The White Hall, planned by Ernst v. Ihne (1892 – 1893). 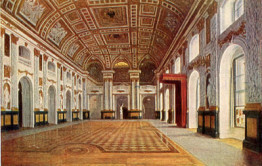 Even if this version was again covered in white marble, the ceiling was gilded and colored, so that the hall had a distinctly warmer effect than its predecessor. In 1701, Elector Friedrich III of Brandenburg crowned himself King Friedrich I in Prussia. 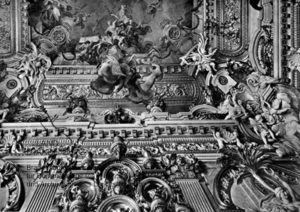 For this event Andreas Schlüter had already been commissioned in 1699 to extend and convert the Renaissance palace beside the Spree into a magnificent residence in Italian Baroque style. 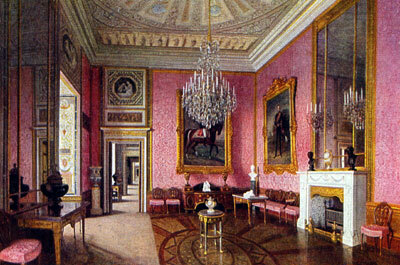 In the form of the parade chambers, he created ostentatious interiors to underline the king’s power and grandeur. 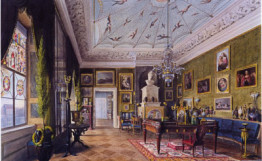 At the same time, Johann Friedrich Eosander, (also known as Eosander v. Göthe), took charge of construction work on Queen Sophie Charlotte’s summer palace in Lietzenburg, later Schloss Charlottenburg. 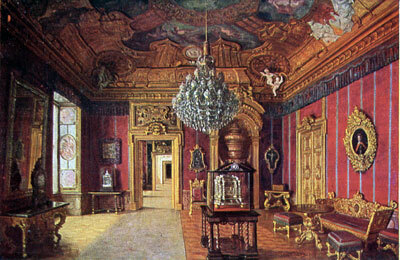 In the palace’s Red Chamber he wanted to install amber panelling and commissioned Gottfried Wolffram, a Danish amber carver, with the task of making it. He made slow progress. 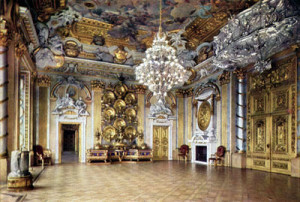 In 1707, Ernst Schacht and Gottfried Turau, amber turners from Gdansk, were therefore brought in and they completed the Amber Room at the end of 1711. 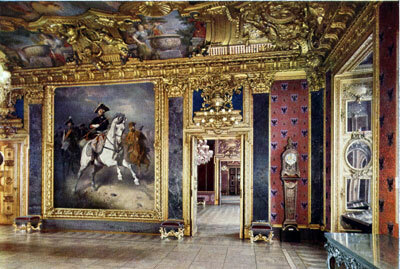 Too late for Schloss Charlottenburg, where it was no longer needed. 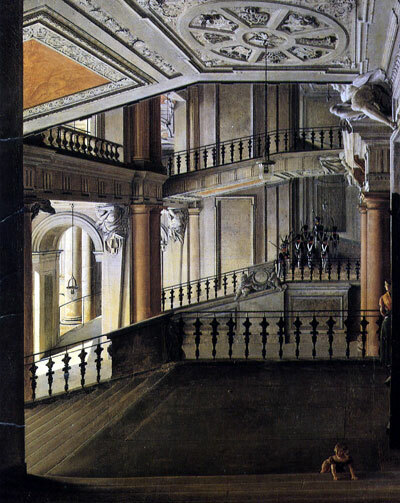 The plan now was to install it in Schloss Oranienburg, but that never happened either. 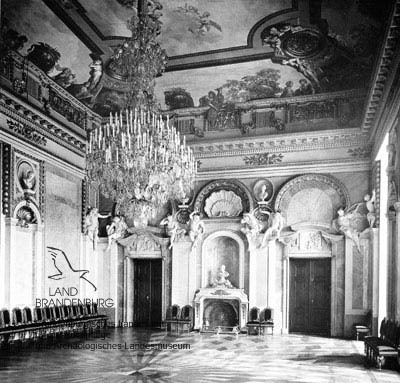 Finally, it was installed in Berlin Palace, in the much smaller, northwest corner room on the parade floor of the Eosander building, right next to the White Hall. Due to this room’s size, not all of the panels could be used and some were therefore put into store. Later, after the extension of the Amber Room, this chamber became Friedrich Wilhelm I’s famous ‘tabacs-collegium’. In 1713, Friedrich I died, leaving behind huge debts. His successor was extremely frugal and did not care for his father’s grandiosity. He therefore did not think much either of the ‘Cabinet of Amber’. In 1716, Tsar Peter 1 of Russia was at the Berlin court. In cavalier fashion, he mentioned what he would most like to take away with him as a gift from the city. 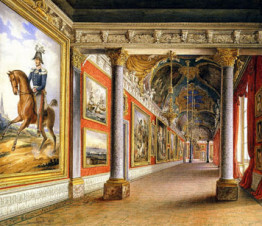 Friedrich Wilhelm I thus gave him valuable treasures from his father’s possessions in order to ensure his goodwill as an ally, in particular in relation to the takeover of Pomerania by Brandenburg- Prussia. 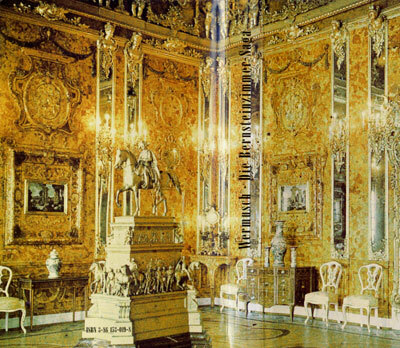 The Amber Room had cost 30,000 Imperial Thalers, far less than the ‘Hunting Ship’, which was worth 100,000 Thalers. In 1717, the room left Berlin and via Memel and Riga was taken to St. Petersburg. 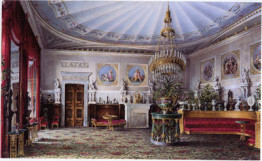 There it was initially installed in an old winter house and six years later in the winter palace. 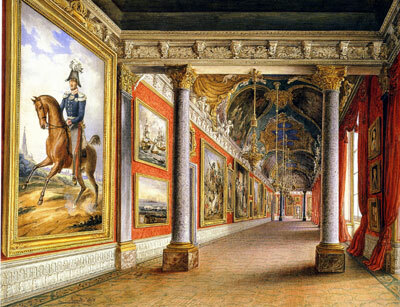 From there it moved in 1755 to the Catherine Palace in Tsarskoye Selo. Modelled on Versailles, this was the summer residence of the Russian tsars. also used in this project. It was by then Frederick the Great who gave them to the Tsar. In addition, many new parts had to be made. 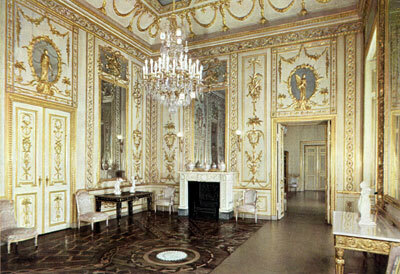 These included, for example, 24 Venetian mirrors and one amber-framed mirror. 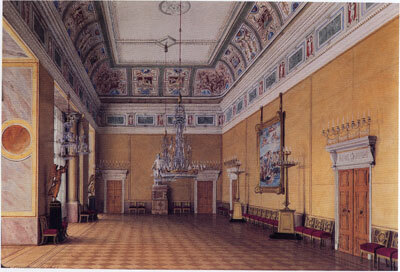 After the enlargement, the room thus consisted only to a relatively small degree of the original room from Berlin Palace. The statue of Frederick the Great, created as a miniature copy of the famous statue in Berlin, was not put up until the 19th century, when it was added as a sign of admiration and gratitude to this Prussian King. It was not until a few years later that the ‘Ruler of all Russians’ remembered that he had promised a gift in return. King Friedrich Wilhelm I had a preference for tall soldiers, whose height had to be at least 1.9 metres. Fitted out with a very high cap, they were frighteningly tall, as people in the 18th century were, after all, a lot shorter than those of the 21st century. The ‘Langen Kerls’ (Tall Fellows) thus became the King’s favourite guard regiment and led to him being known as the ‘Soldier King’, although he never fought a single ‘real’ war with them. In order to indulge the King’s preference, the Tsar therefore sent 55 ‘Tall Fellows’ armed with guns from Tula to Berlin in the summer of 1718. He also sent a wood-turning lathe (for which the King also had a penchant), a rowing boat and an ivory cup that he had made himself. Now that is the true story!